I got some New York postcards from Wanda a few years ago. This is one of them. I really like street views like this! 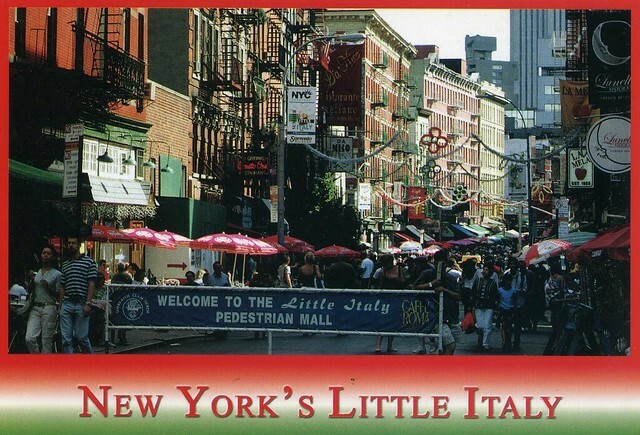 Little Italy is a neighborhood in lower Manhattan, New York City, once known for its large population of Italians. Today the neighborhood consists of only a few Italian stores and restaurants. It is bounded on the west by Tribeca and Soho, on the south by Chinatown, on the east by the Bowery and Lower East Side, and on the north by Nolita. Little Italy on Mulberry Street used to extend as far south as Worth Street, as far north as Kenmare Street, as far west as Lafayette Street, and as far east as Bowery. It is now only three blocks on Mulberry Street. As of the 2000 U.S. Census, 1,211 residents claiming Italian ancestry lived in three census tracts that make up Little Italy. Those residents comprise 8.25% of the population in the community, which is similar to the proportion of those of Italian ancestry throughout New York City.